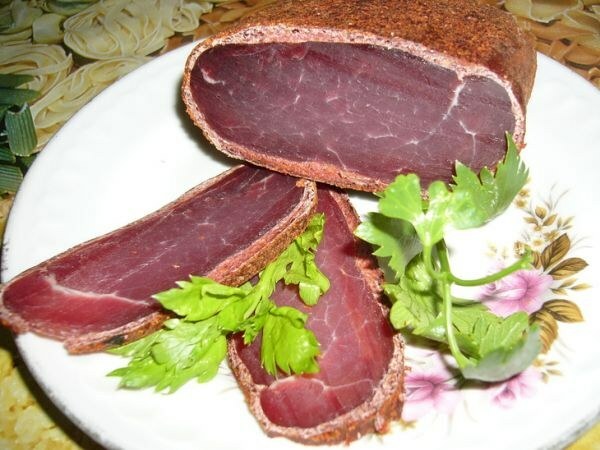 Basturma is a cured meat dish of the Armenian cuisine. This delicacy is hard to find in stores, and price it accordingly high. So lovers of pastrami prefer to cook it at home. The process is long, but the result is worth it. Before the pastrami was made mainly by hunters. They had to save a large amount of meat for a long time in warm climates. Of course, no refrigerators, no freezers did not exist. But home cured meat remained fresh for about six months, and therefore enjoyed great popularity. To make basturma at home is quite simple, but the cooking process takes a lot of time. The longer the meat is getting dry, so it will be tastier and more tender. Cook this delicacy from lean fresh meat cuts of beef or lamb. - garlic - 4 cloves. - dry red wine - 150 ml. In a large pot pour the wine and mix it with spices sumac, Chaman, nut grass, salt and crushed garlic. In the thus prepared marinade, place the piece of tenderloin whole, press it with something heavy, close the container lid and place in a cool place for exactly a week. The marinade should cover the meat completely. After seven days, remove meat, allow to drain excess fluid, and the remains blot with paper towels. Make the batter for coating the meat. To do this, mix all the ingredients in the specified quantity. Dough obvalivanie should get the consistency a little thicker than for pancakes. Apply the mixture on the fillets, the thickness of the layer should be about 2 cm, Roll meat in mixture of spices according to your taste. Put on a piece of strong string and hang in a cool, dry and dark place which is well ventilated at least 10 days, but better for 2-3 weeks. During this time the meat is soaked with spices and well dry. Ready homemade pastrami should be the same hardness as the sausage. To serve this delicacy have sliced, with greens. Not superfluous will have a good glass of wine.